Cables To Go's 3-in-1 Universal Hi-Res KVM Cables are high-quality, universally compatible cables to work with KVM switches from many leading manufacturers. These cables feature keyboard, monitor, and mouse combined into one cable split apart at each end. The 3-in-1 design, plus color-coded connectors, makes this cable easy to manage. This unibody design makes them tangle-free. 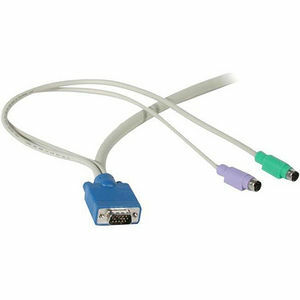 The VGA cable is built from premium coaxial cables, which ensure superior resolution and crisp ghost-free images. The fully shielded unibody KVM Cables ensures you maintain excellent signal integrity and video quality at all offered lengths. Single jacket, unibody molding not only shields your cables from EMI/RFI interference, it also cleanly connects your KVM to your computer, without the inherent clutter and mess you have with ordinary individual cables.